Maui'd Forever Contracts with Barefoot Tours in Hawaii to Provide Activities and Advice at a Discount for the Wedding and Vow Renewal Clients. Maui'd Forever, Hawaii's premiere wedding planning and coordination company is dedicated to being an effective and cost effective way to provide for one’s entire Hawaii wedding, reception needs. After getting many requests for luau’s, boat trips, sightseeing and other activities they decided to contract with a provider of all the possible activities on each Hawaiian Island. After a search for the best they decided on Tom Barefoot’s Tours. With this relationship, Maui’d Forever clients can now preview these activities on the same website where they see the wedding packages, wedding locations and all the wedding vendors. They are also provided with an activity agent that can provide experienced advice. These agents have experienced many of the activities personally. They are encouraged to try them out and at no cost to the agent it is a fantastic lifestyle. A phone call answers many questions clients have such as which is the best snorkel trip for me? How do I get to the luau? How much does it cost? This expert advice is one of the reasons why they selected Barefoot. Most of the activities they provide are done so at a discount. So with the ability to reserve most any activity on any island at a discount with expert advice was what swayed Maui’d Forever to work exclusively with Barefoot. The clients are given a discount code (#1659) which they use when they speak to their agent. The discounts are already calculated into online sales for those that want to self book on the website. Maui’d Forever provides the link and code for those that use any of their wedding or vow renewal packages. 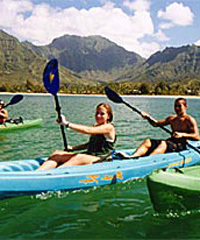 They can do these packages on Oahu, Maui, Kauai and the Big Island of Hawaii.